During the summer I saw a preview for the movie The Maze Runner and I was instantly intrigued. It was a movie that I definitely wanted to see despite knowing nothing about it; it was only later that I discovered it was also a book! Opening weekend, I went to see the movie and I was suitably impressed; enough so that I ordered the book from my local library even though Young Adult novels are not usually in my reading repertoire. After waiting for forty-nine other people to read the book and return it, I finally got my hands on it and it was definitely worth the wait. I read the entire book in one weekend, unable to put it down for long even though I knew where it was going having already seen the movie. Beginning with the main character of Thomas waking up to find himself in a dark elevator heading up to who knows where, The Maze Runner doesn’t ease you in to the story but starts off with a bang. The only thing that Thomas can remember is his name and he is suddenly thrust into a strange situation where the only people around him are other kids his age; he doesn’t actually remember his age, but the youths who meet him as he exits the elevator in a large glade guess he is around sixteen. The Glade is split in to several sections for farming and livestock and living quarters, and is led by Alby who has been there the longest, around two years. Alby is a very taciturn character and Thomas is a little put out by how he is treated until he sees that Alby treats everyone the same way. The second in command is Newt and he is much more sympathetic to Thomas’ situation, helping him as much as he can. After spending a day at each of the jobs available in the Glade, Thomas is determined to become a Runner, someone who goes out each day to map the routes in the massive maze which surrounds the Glade. Before he can do this, another new arrival comes to the Glade, this time the first girl ever to be sent there. Along with the girl, who we later find out is called Teresa, is a note saying that she will be the last one ever and suddenly everything changes. With Teresa in a coma and unable to explain anything further, Thomas is finally granted permission to the run the Maze while the others try to figure out what the note could mean for their survival. Out in the maze, Thomas and Minho – the leader of the Runners – encounter first hand the monsters that haunt the Maze, Grievers. Described as a huge slug with metal spines shooting out at intermittent intervals, they roll their way around the Maze killing any runners that might come across them; that is until Thomas and Minho manage to evade them for the night. Grievers are also known to sting runners and the only chance for them to survive such an attack is to take the serum that is provided in the weekly supplies sent through the elevator. Going through this is called the Changing as the boys who go through it are never the same again. However, what no-one realises until Thomas arrives is that the Changing also brings back some of their memories – perhaps explaining why they have so many issues afterwards. When Alby is stung and goes through the Changing he talks constantly about how terrible the life before was, and that he had seen Thomas before. Thomas is shocked to hear this and it isn’t until Teresa finally wakes up and confirms part of Alby’s story that Thomas realises he is a major part of what is happening to both him and the others in the Glade. When Minho and Thomas find a way that the Grievers enter and leave the Maze, they decide that they might be able to use this to escape. However, to convince the others that they have to chance the Maze in order to gain freedom, Thomas decides that he must get back his memories and deliberately allows himself to be stung by a Griever so that he can go through the Changing. His memories reveal more than he could ever expect including his part in the set up of the Maze and even though he is horrified that he is involved, he remembers enough to be able to figure out a way for them to run the Maze and possibly escape. Despite losing a number of the boys along the way, they do manage to get out and find themselves in a sort of lab where a woman starts to tell them what is happening, before a group of mercenary soldiers rushes in, kills everyone in the lab and rescues the group of kids to drive them away to safety. My first impression of the book was that the characters are very well fleshed out, something that is not always easy when the main point of the book is that they have no memories of their time before they arrived in the Glade. Often characters with some form of amnesia are one-dimensional but I never thought that about any of the characters in The Maze Runner. Thomas was interesting and empathetic from page one and was well written but without taking anything away from the other characters. Even characters that only appeared for one or two scenes were interesting and I felt like I knew all of the boys in the Glade, making their story that much more heartbreaking as the secrets behind the Glade and the Maze became known. I also thought that the story was well written. While it was obviously leaning towards a young adult audience, I did not feel that it was written in a “young” fashion, a mistake that some Young Adult writers make. As a reader in an older age group than the target audience I did not feel like the book was exclusively for young adults and I liked the writing style. I don’t know if James Dashner always intended the book to be the first part of a trilogy or series, but I felt like the book was well contained in itself. It did not feel drawn out which can sometimes happen if the writer has a longer series in mind so doesn’t want to give everything away in the first book. In my opinion this book is written with the content and pacing to have been a stand alone novel and only the fact that at the end the situation outside the Glade is not resolved makes you realise that the story is still going. 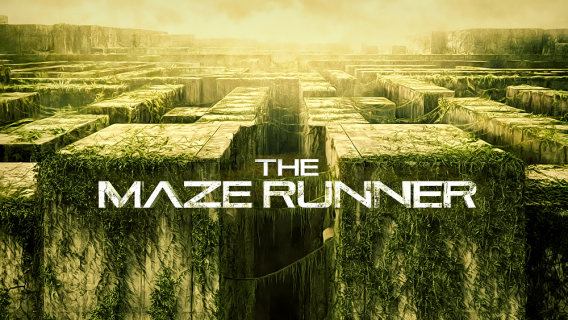 As I mentioned earlier, I really enjoyed the movie adaptation of the Maze Runner. Starring Dylan O’Brien (Teen Wolf) as Thomas, the movie starts with an adrenaline boosting elevator rise to the Glade and doesn’t let up until the final credits run. Dylan O’Brien was brilliantly cast and portrayed the terror and strength of Thomas perfectly. His vulnerability and fear combined with the determination to find a way out were captivating to watch and I was completely invested in his story. Aml Ameen (The Butler) as Alby, Kaya Scodelario (Clash of the Titans) as Teresa, and Thomas Brodie-Sangster (Love Actually) as Newt all gave excellent performances and, now that I have read the book, were all very true to the characters written by James Dashner. The rest of the cast including Ki Hong Lee (She Has A Boyfriend) as Minho, Blake Cooper (Prosper) as Chuck and Will Poulter (We’re The Millers) as Gally were also amazing and reading the book after having seen the movie, I think that it was cast very well. I thought that the special effects were outstanding in this movie. I always judge visual and special effects by whether or not I think of them as effects while I am watching or if it is only when I look back on them. I find that if I think of it as an effect while watching it takes me out of the “reality” of the movie and at no time in The Maze Runner did I feel this. The effects were seamlessly integrated with the live action and this made them even more terrifying, particularly with the Grievers. There were a few differences between the book and the movie but I did not feel that this detracted from my enjoyment of either. In the movie, Teresa becomes a part of the story as soon as she arrives, but in the book she is in a coma for a large part of it, only emerging near the end. The Grievers description in the book is different to how they are portrayed on screen but I feel like how they are written would have been difficult to show menace on screen. They definitely were terrifying and menacing in the book, but having a protagonist that rolls like a slug is not always something that will translate well on screen. Being more spider like in the movie made sure that they exuded the threat in a real fashion. The biggest thing I noticed that was omitted from the movie was the fact that once Teresa woke up, her and Thomas were able to talk telepathically. This may be something that will be explored in the next movie, but I am actually glad that they did not use it. While I had no problem with it in the book, telepathy is something that can be shown well in a movie but it does tend to slow things down. The Maze Runner was a non-stop action escape movie at heart and I think the telepathy angle may have detracted from that. It also means that there is a new angle to pursue in the next movie. I really enjoyed both the movie and the book of The Maze Runner. Both were complete stories but leaving you with a hook at the end making me definitely want to read the next book and watch the next movie. Now I just have to decide if I want to read the next book before I see the movie or watch the movie before I read the book! Either way I am sure that I will enjoy both.